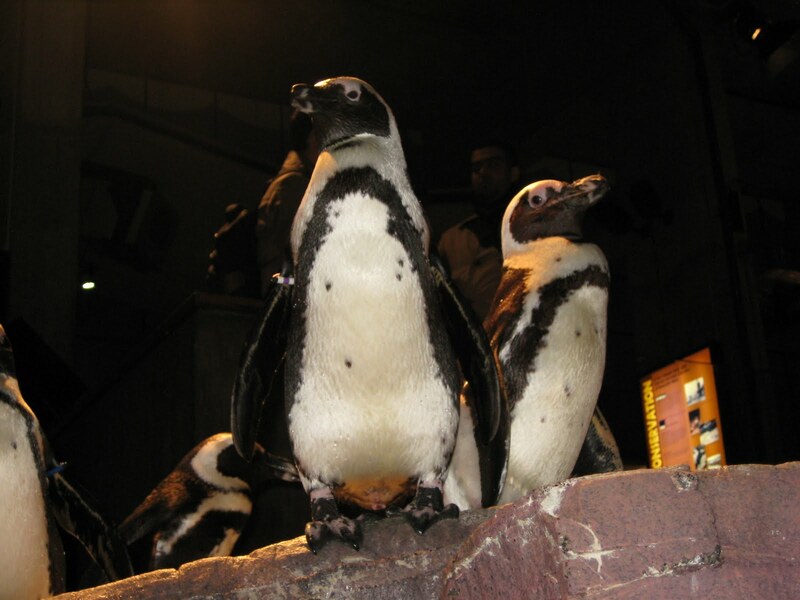 Today I would like to introduce to you two of our African penguins. Here are Spheniscus II and Demersus II. Spheniscus has a purple and white bracelet on her right wing, and Demersus has a purple and white bracelet on his left. Sometimes we give mated pairs matching bracelet colors on opposite wings, but Spheniscus and Demersus are not a mated pair, they are actually sister and brother. Their parents are Good Hope and Peeko. Spheniscus hatched on July 28, 2006 and Demersus hatched four days later on August 1. African penguins along with 15 other penguin species lay two eggs (king and emperor penguins are the only two species that lay one). Sometimes both eggs are fertile, sometimes only one and sometimes neither. 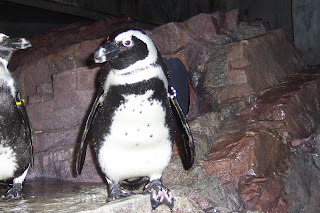 If both eggs are fertile and hatch African penguin parents will make every attempt to raise both chicks. Not only do Spheniscus and Demersus have matching band colors but their names match as well. Spheniscus demersus is the scientific name for African penguins. Translated spheniscus means little wedge, and demersus means to plunge, which discribes the penguins shape and diving behavior perfectly!